The dash board doesn't have to be the entire length of the car it can be a small instrument panel off to one side. Can you bolt to the coil box the firewall mounted wedge type ign switch/amp meter plate bracket that I guess trucks used? 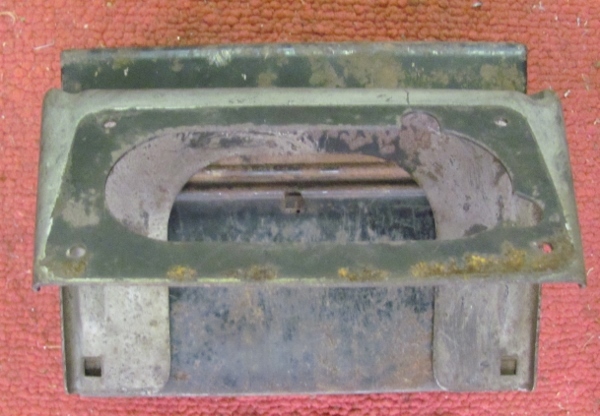 If you use an early coil box switch it mounts on the surface of the box so you won't take up any space inside. The wires run in groves in the wood bottom panel. 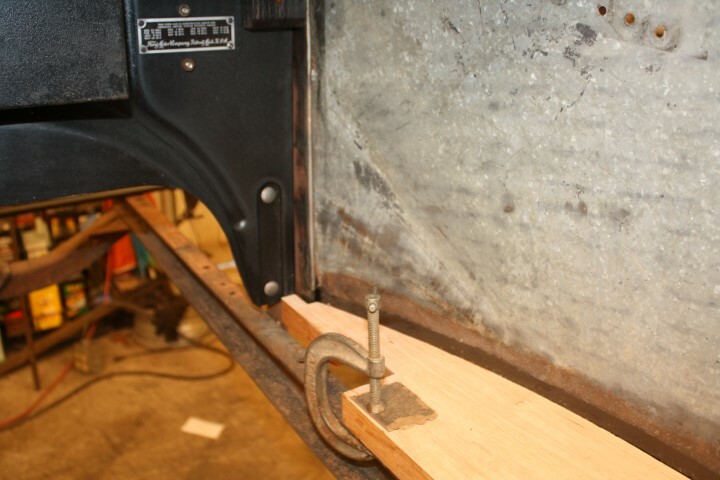 You can mount gauges in the top section of the floor boards and use quick disconnect wire splices in case you need to remove that section of the floorboard for any reason. 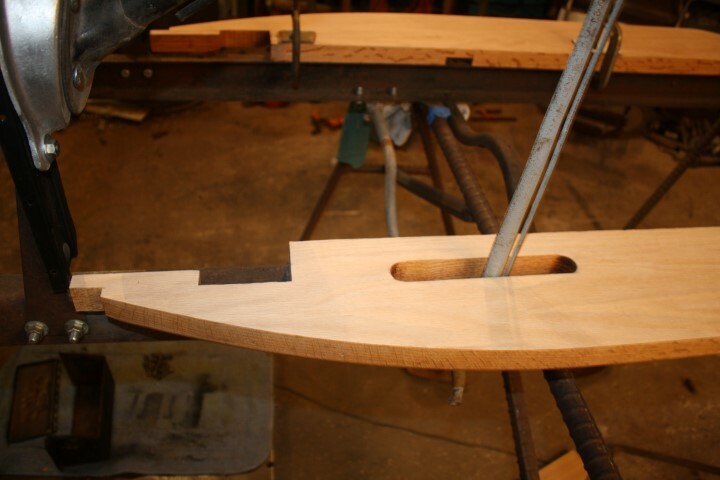 How my Boat-tail was done. The cowl is similar to yours. A small board stands back of the firewall only about two inches and has the combination switch and dash lamp on it. 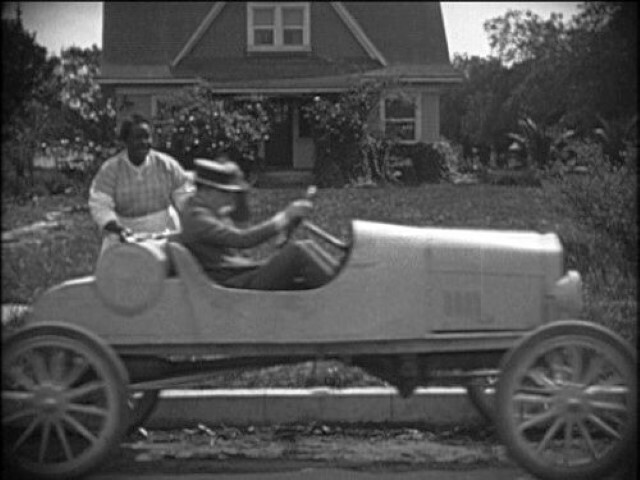 I figured if something like that was good enough for Pierce Arrow in 1919, it was good enough for my little car. When I was working on it, I made a similar small panel for the other side in case I decided to put in a speedometer. Don't know if I will ever get around to that or not. It's yours to design, as for me, would choose a 'year' of the build to limit those items. Generally, a brass, pre '19, no electric on the Ford, would be without dash, and coil box with switch. And would be only a simple firewall speedster. Built this in the '70's and 'build date' was 1915, so made all the features of what was available in that year, and nothing later. With a stream line full cowl as your speedster, one would assume a dash under that cowl. 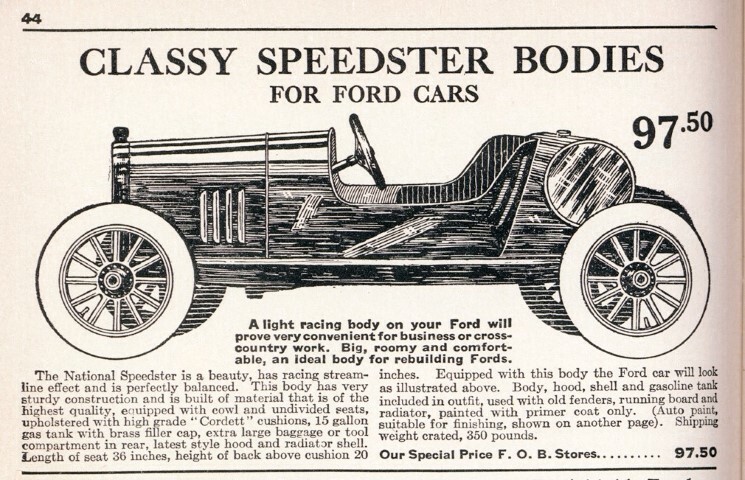 The ads for these style 'County Fair' racer bodies indicate a dash. The below ad states in the copy a 5" panel for the dash. 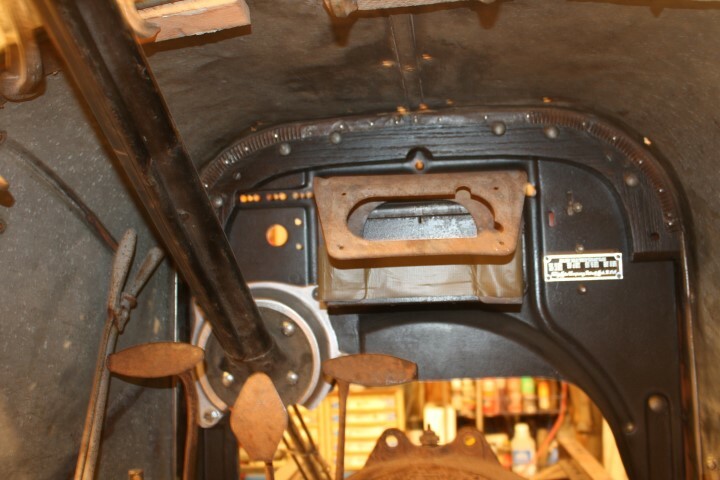 So you could add a wood dash, it would also provide much needed support to the metal cowl, as dash supports could run up from your sills. With a 'twenties' build date to your speedster or whatever year you select, then stay with period parts that aren't newer for that 'old' look. 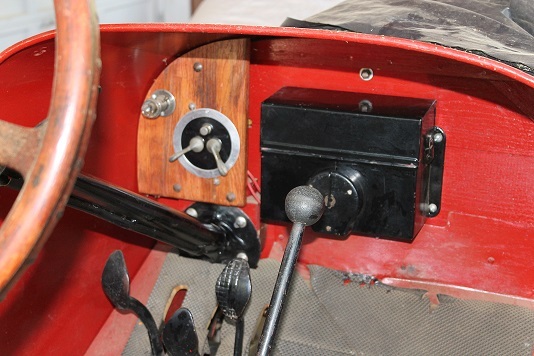 A dash is a great place to add period accessories too, speedo, guage, switches, dash lamps, etc! 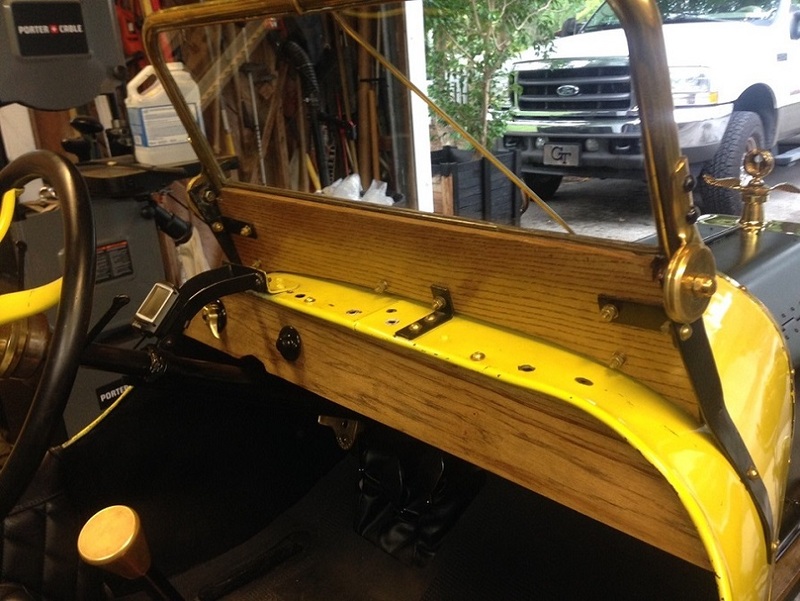 Donnie -- John's idea of putting the brake lever outside the body seems to me like a good one. Just lengthen the shaft, and there you go. I am trying for a 1920s-ish type of build. 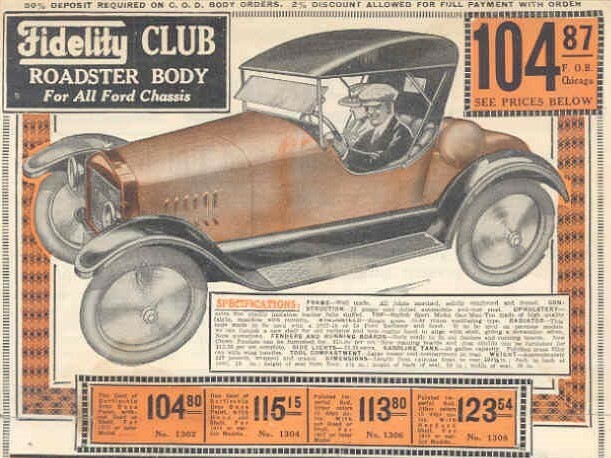 Most of the "cowl" or "body bucket" types of bodies seem to be from early 20s era up. 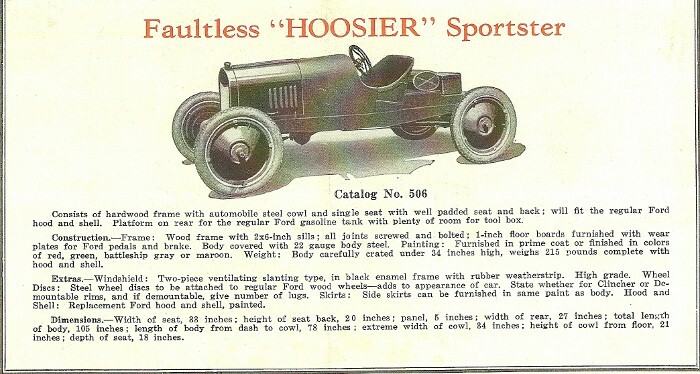 I had thought that all of the bodies in the style, similar to the "hoosier" shown above would have used a dash of some sort. But I have seen several period photos of bodies like that with no dash. I may go with the handbrake outside. I have been doing mock up to see how it "fits". That hand brake is going to be an "aggravation" if left inside. It is a tight fit. Also, it appears that my "bottom end" is going to be 3 to 3-1/2 inches off the floor. I did a mock up of the windshield frame today. It is the one that Langs has started casting. They have them in their on-line catalog in aluminum or brass. They are rough castings and I probably got one of the first ones if not the first one. I just wanted to see how well it was going to fit. It fits the shape of my cowl very well. 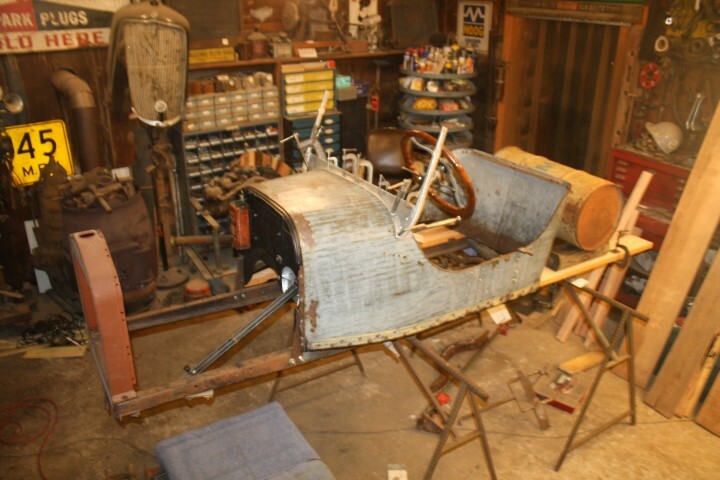 My mounting hardware still needs a little work, , but I think the windshield frame/posts will work fine. In my mock ups I am also trying to figure out the style of gas tank Ill use. 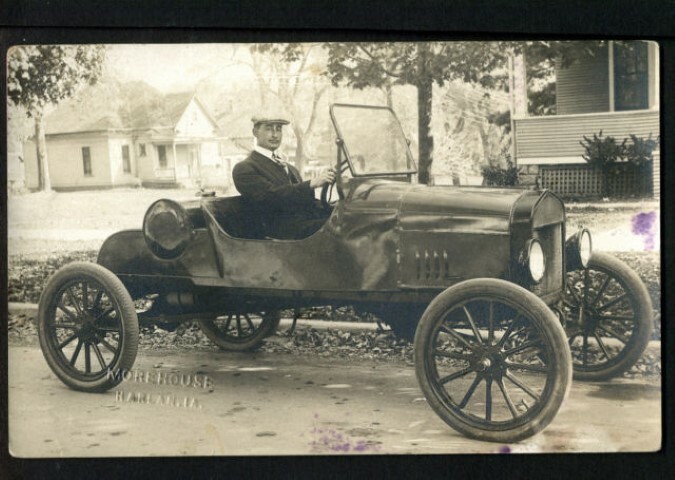 I had considered the "hoosier" shown above with the stock oval Ford tank. Most of the aftermarket bodies I have seen in ads and period photos, use a 20 gallon tank supplied with the body. That would be a tank aprox. 14 inches in diameter and 31 to 32 inches long. 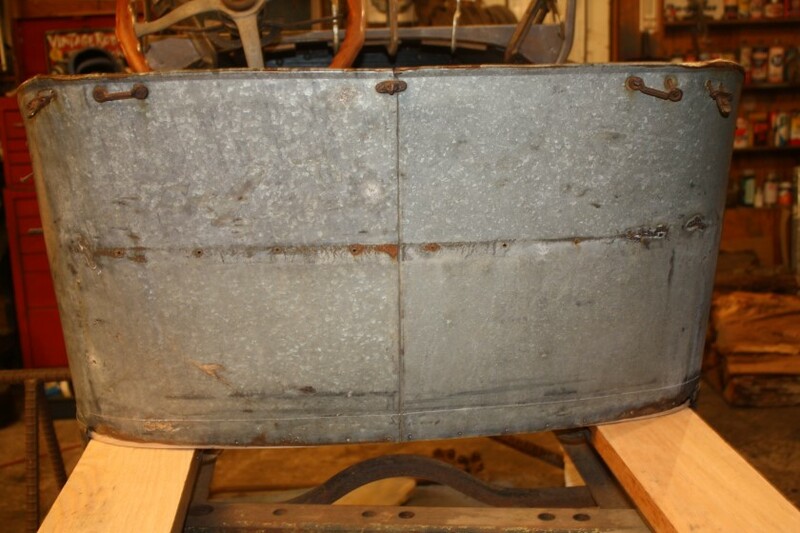 (for mock up purposes I have an oil drum that is 14-1/2 inch in diameter) The gas tank maker that makes the tanks for Langs and probably everyone else is located here in Arkansas about 2 hours from me. I talked to him about making a "special" tank for me. 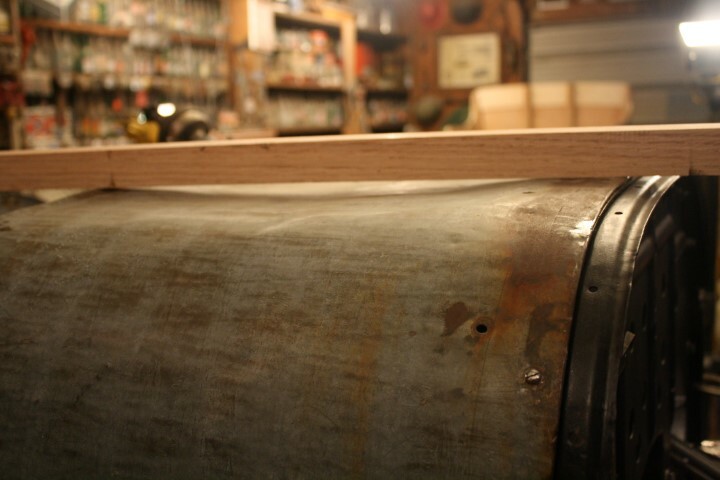 He is going to make it the same 14 inch diameter, as a "torpedo" tank but 31 inches long. The cost is the same as a regular torpedo tank, no extra for the "special" length. So I think that is the way I will go with the gas tank. Ill post a few photos of the days mock up and a few pictures of ads or original cars in the style Im leaning toward building. 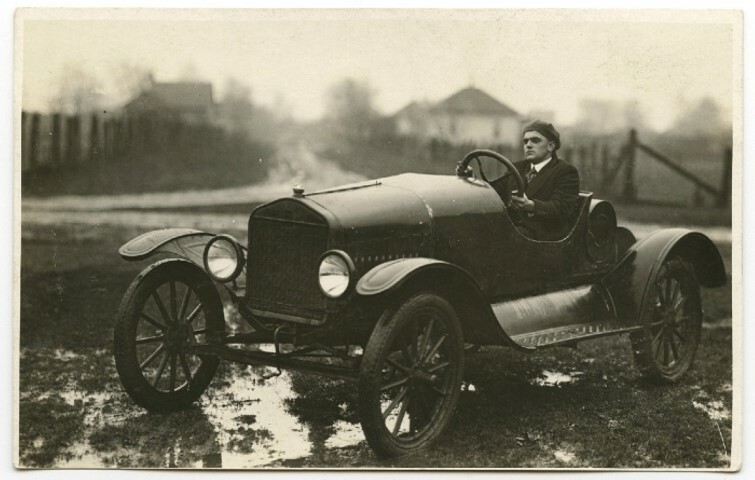 I really love the full fendered car in the muddy road, but I also like a fenderless car. Oh ... the decisions, decisions, decisions, . I suggest a wing style dash as in the image below. For the brake lever, just bend it at the bottom in a slight S to move the bottom to the side and angle the upper part away from the cowl for knuckle room. If you include the lever rod in the bends, it will still work since it just lifts the pawl. Ken, that is an idea. Ill have to play around with it and see how it works and looks. I also found another ad similar to my style body. 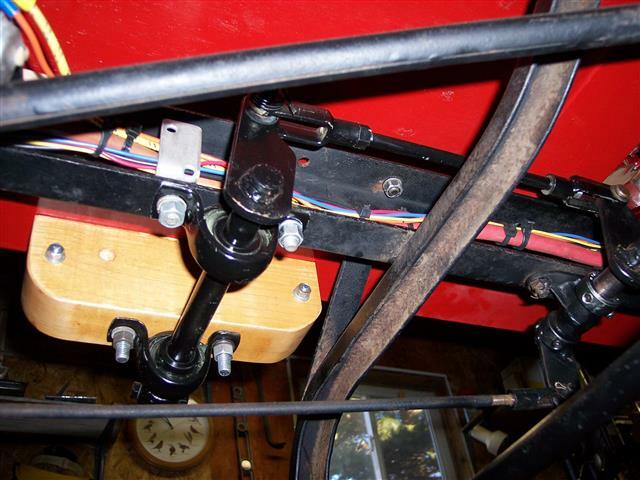 Moved my hand brake lever to the outside and back some on the speedster. Best thing ever. Easy to reach and lots of foot room. For what it is worth. 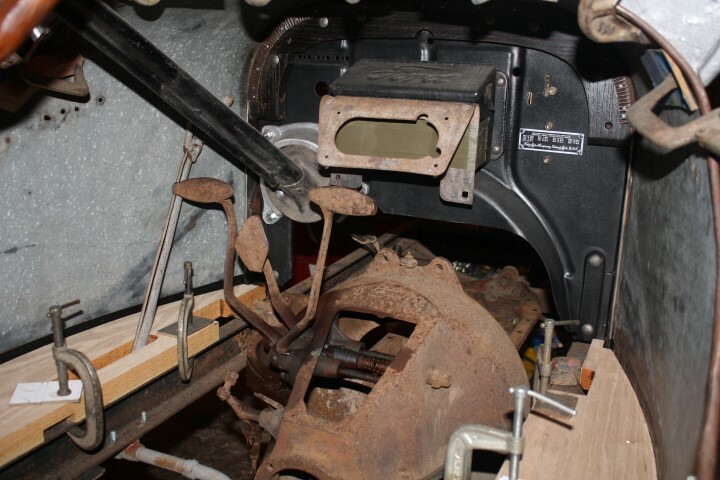 I think five of the six speedsters I have resurrected, I heated and bent the brake handle in some sort of "Z" fashion. I angle the handle at the bottom (just above the floor) towards the back to make it easier to reach from the seat. I also usually give it a little angle out closer to the body side (for foot room). 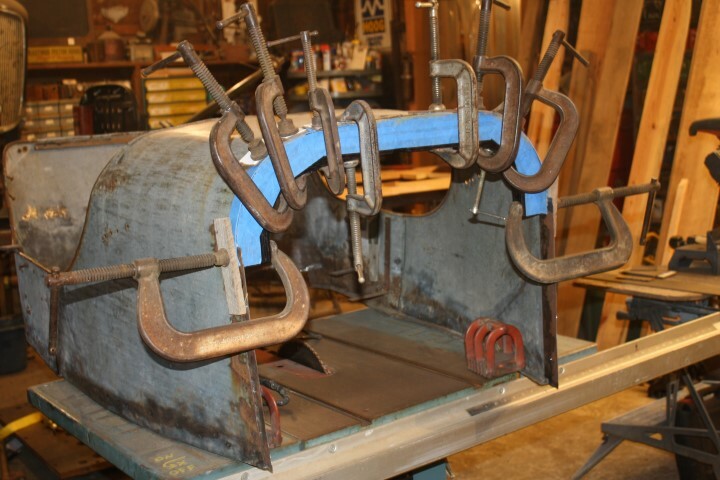 Then I angle the top of the handle forward to make it easier to grab, usually with a bit of a kick toward the inside at the top (so my knuckles don't get skinned on the inside of the body). As I recall, I posted a couple pictures of those a few years ago, but cannot seem to find them on my computer to re-post. Mounting the brake handle outside is also a good solution. I have never done it, but I have seen several cars done that way and they do look good. With my six foot even , long legs, and size 10 1/2s, the brake handle inside seems to work for me. A dash something like Ken K shows could be good. Three of mine had full dashes. Two of them were a bit close where the handle crossed under the dash. But I never pinched my hand. Your car is really beginning to shape up nice! It sounds like your gasoline tank issue is well resolved. I see (and have seen) several variations of that cowl and seat setup. And I have seen ads for at least three different companies providing them plus I think two more above that I had not seen before. I wonder how many versions of that kit were available? You may never know for certain who built yours. But that is okay. Either choose one that is close and go with it? Or welcome to the unknown maker's club! Agree, that's a good idea from Tyrone, missed that in scanning his post! And since you have that neat windshield, there is plenty of stability for the cowl now, a wood dash panel isn't required. As all of the starter chassis only, came with this style panel, to mount the switch and amp gage, makes sense! And will look neat. I make a new reproduction of that instrument panel that is made exactly to Ford drawings if that helps. They are finished and ready to bolt on. 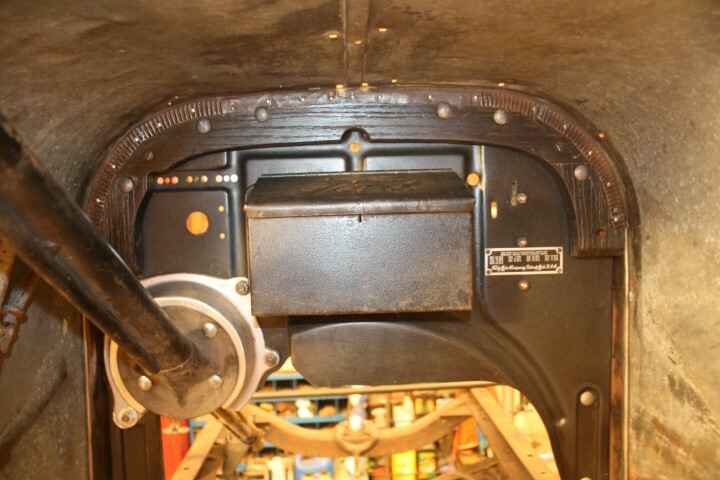 1, The chassis/truck instrument panel by itself, mounted where the coil box goes. and leave the handbrake where it is and have no dash board. 2, Move the handbrake outside and make a dash to match my steering wheel (and keep my coil/glove box). 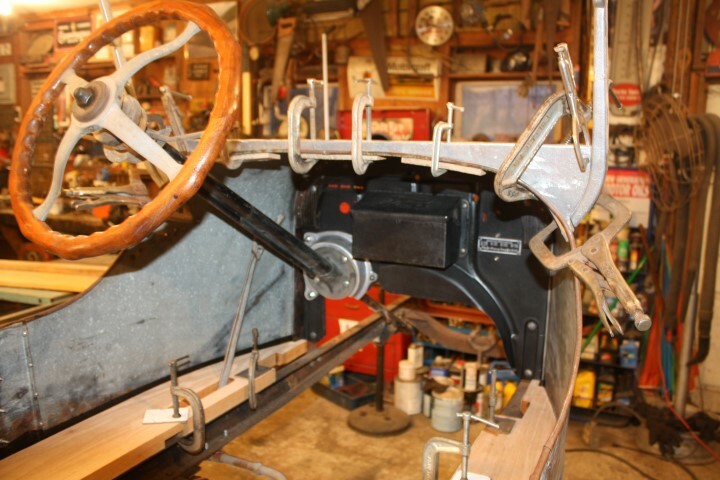 3, or bend the handbrake over and shorten it to clear a wood dash (that matches my steering wheel) (and keep my coil/glove box). 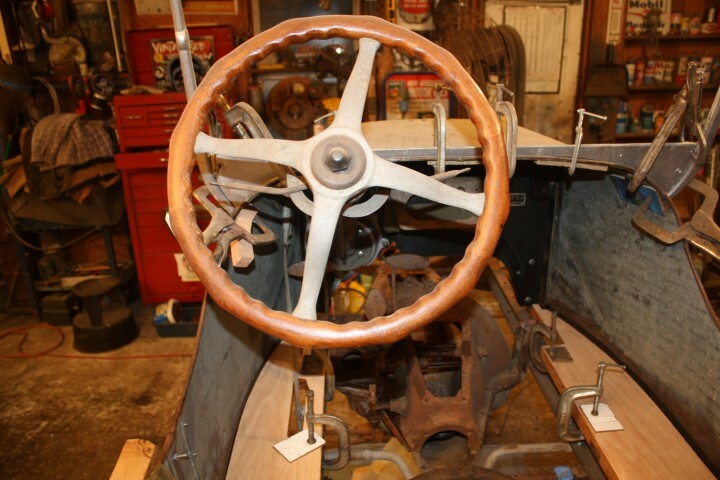 4, or a variation of #1, Move the handbrake outside, use the chassis/truck panel by itself, and have no dashboard. The small ammeter that was original for 26/27 is not very good and the repro versions are worse. I just never had that many people wanting the later version of the panel since most people building depot hacks and such would rather use the earlier ammeter and switch. I do have the drawings for the instrument panel for 26/27 around here - I think. 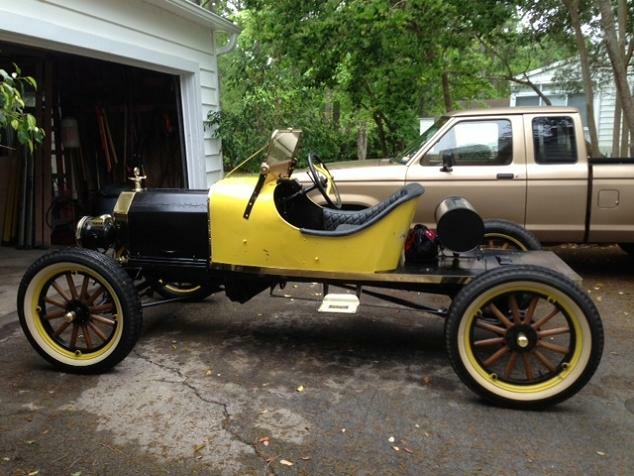 Hey Donnie - I have a body on my speedster that is virtually identical to the one you have. Here is what I ended up doing for my dash. Since that picture I've added one of John Regan's voltmeters (that looks like an ammeter) out to the right side, and eventually will have a brass speedometer in the center. It's a lot easier than trying to reach down in there with the deeper cowl. 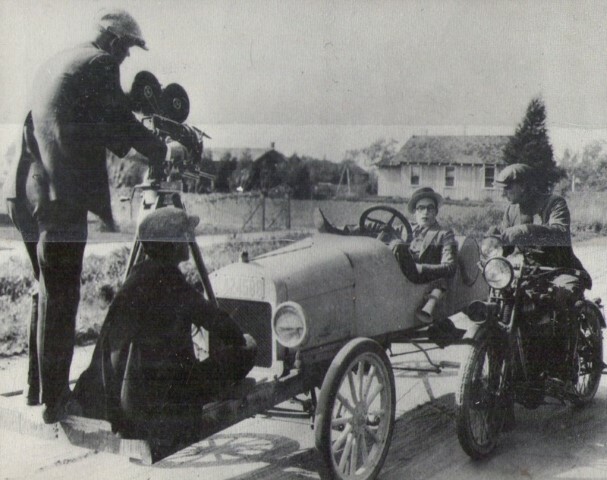 Also - I drove for a long time with the handbrake inside the body. I eventually decided I'd move it outside and if I didn't like it I'd move it back. It's AMAZING. Favorite thing I've ever done to the speedster. So much more room for my left leg, riding is way more comfortable, just can't tell you what a great mod it is. Oh, just one other thought. I've seen a gozillion pictures of speedsters and only ever seen one or two bodies like mine (and yours). 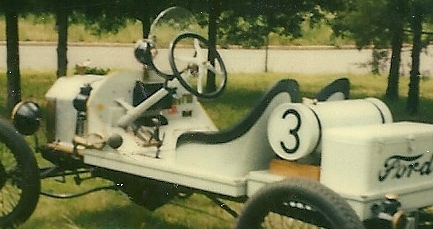 My grandfather built this car in the late 30's in high school and then drove it in college right before WWII. I guess it's fairly "period" correct. 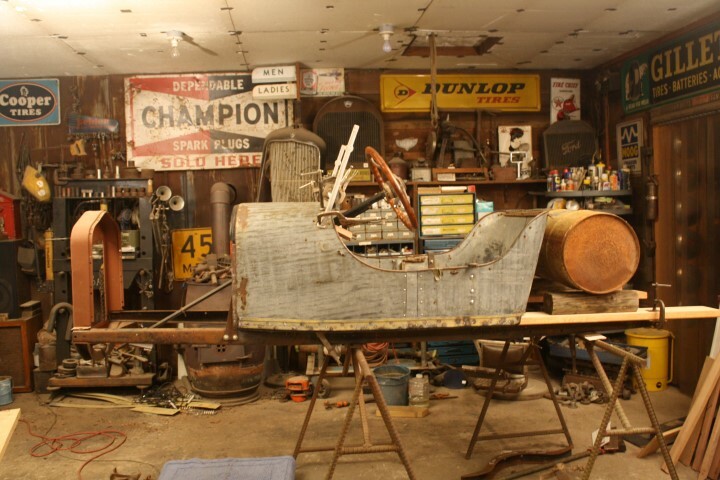 I've never seen anything else like that windshield, they took the original windshield and chopped it down narrower. I don't know if I've seen all of your posts about your speedster but are there any markings anywhere on your body? Like a company symbol or something that say who made it? I've looked around at a lot of pics and between that and talking to my granddad a few years ago I'm reasonably confident that mine is a Hoosier body made by Faultless. I've never seen or found any markings. Anyway, excited to watch your car unfold. Keep posting updates! Seth, I can not find the side view of your car. If I remember right, the "door" area on yours is the shorter version. Mine is the longer version. The short version is a continuous curve and the long version has a "flat" spot in the middle. If you look close at my body, you can see a "splice or extension" in the center. It is about 3 inches long. 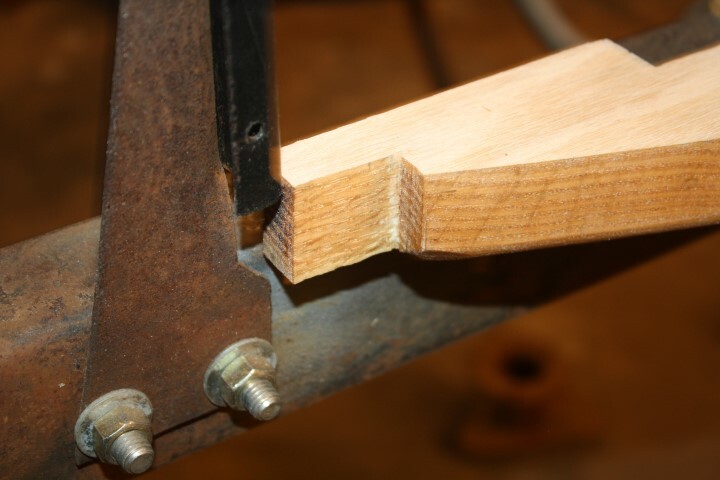 It had to be done when the body was made as the "wire edge" has a continous wire installed in the edge. The lengthening was either a special order, or they needed to do it that way because the sheet metal stock was too small.??? I have looked at hundreds of ads and photos and I have only found the photos above that are similar to mine. 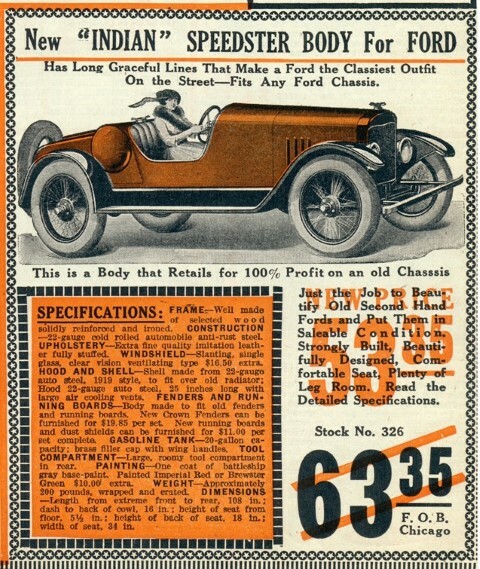 The "Indian" body shown above is probably an "International" body sold by another company. There are lots of different companies selling the same body under "their" name. 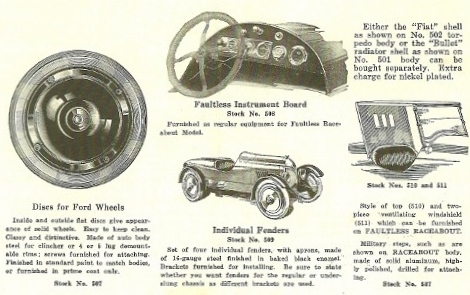 I bought the speedster CD awhile back and it has 100s of ads and catalogs in it. He has done lots of research to make a very good CD. The author stated that he thought that there may only be as little as 50 remaining original bodied cars left. ??? He "may" be right. 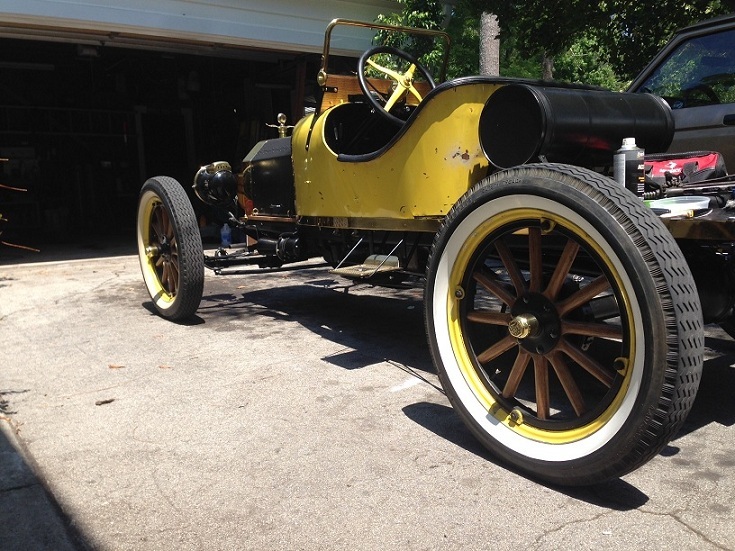 There are lots of speedsters out there but I have seen very few surviving original bodies. There are no markings anywhere on my body. We may never know for sure, but its fun looking . Here's a view of the car from the side. Mine definitely doesn't have the same long flat spot. Please ignore the negative rake to the car, I didn't have the lowered front axle at that point. Second photo the rake has been corrected. =) You can see where the body on mine has lived a hard life. I'm going to take it off and clean it up, weld up some holes, repair a little rust and some of the dings and then repaint it the same yellow. Mine doesn't have that extension, but I have a joint in the same place as your extension. You can actually see two screw heads underneath the end of the upholstery right there where the seam is. You will find that just about all bodies will have a seam just behind the cowl. 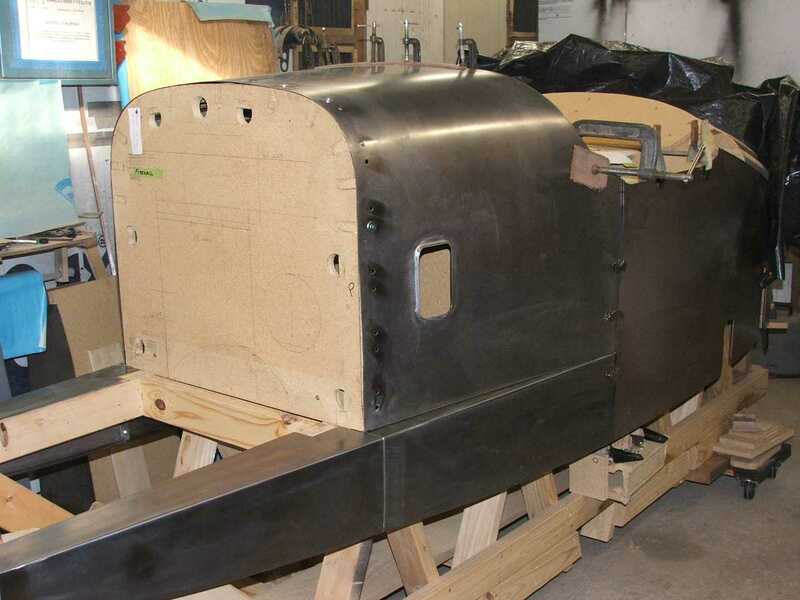 The cowl is made from one sheet of steel and rear/seat area is another sheet. These are the simplest of all the designs. You certainly won't find one stamped from a single sheet of steel. 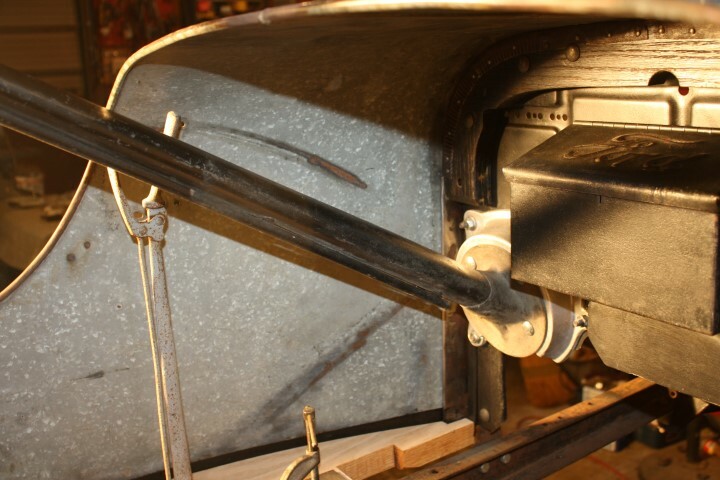 Here is a picture during the process of checking the cowl fit on a Mercury. Here's my hand formed body - no seams showing on this baby - 20 gauge steel ! I'll try and find a better photo - man (neighbor) on left was WWII veteran and man on right is my "flying buddy" with his 1941 Stearman he restored himself. Except for the lower front skirt (under the hood area), the Mercury above won't show any seams either. It's temporarily held together with magnets for fitting. The front skirt is detachable. It's all 18ga. steel. All the 1/4" wire edging along bottom skirting was done by hand. 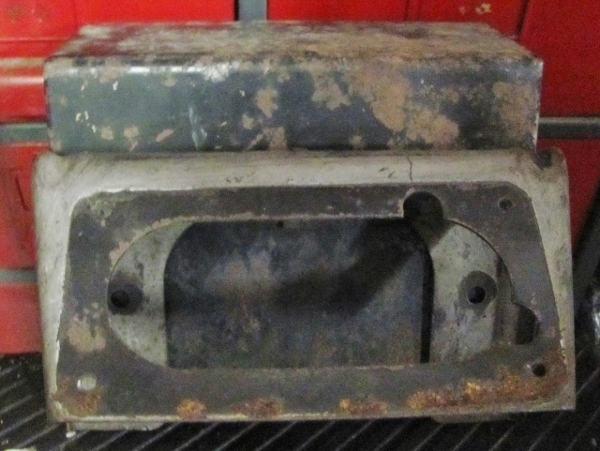 Primarily because the large rear panel was too large to handle rolling through the dies. It's one long piece from the cowl seam to the rear--About 75". Very nice work guys. My sheet metal, is like a sack of walnuts. But for the style of speedster Im trying to build, with all the patina, I feel like each little dent is a "badge of honor". Seth, does your body have a row of holes across the back panel.? Mine has a row of holes that would line up with the styles of bodies I show above. The "trunk back" style seems to match up with all my holes and wear lines. Ill post a pic of the rear panel. So that is how Im going to build my rear deck/tail section. I have found enough old galvanized sheet metal to build the panels from. 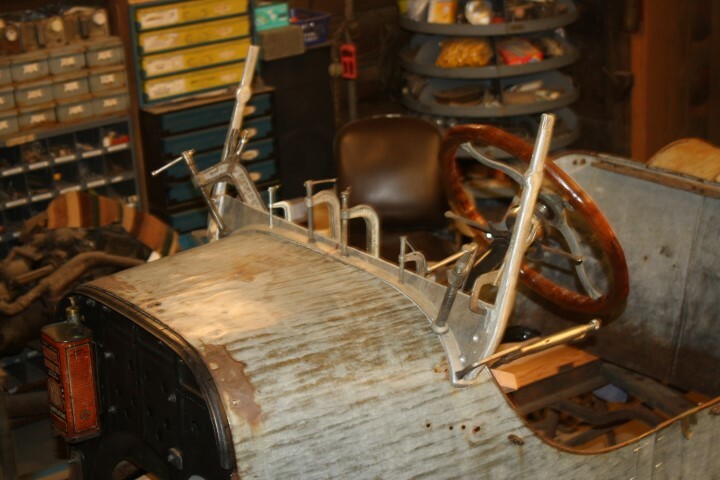 The used sheet metal has enough holes, dents, and rust to blend right in... . I put two push-pull switches in the floor right in front of the seat on the drivers side. One for ignition, one for lights. Easy reach and looks clean. Made brass knobs to make it match the rest of the car. You could mount the factory multifunction switch the same way. 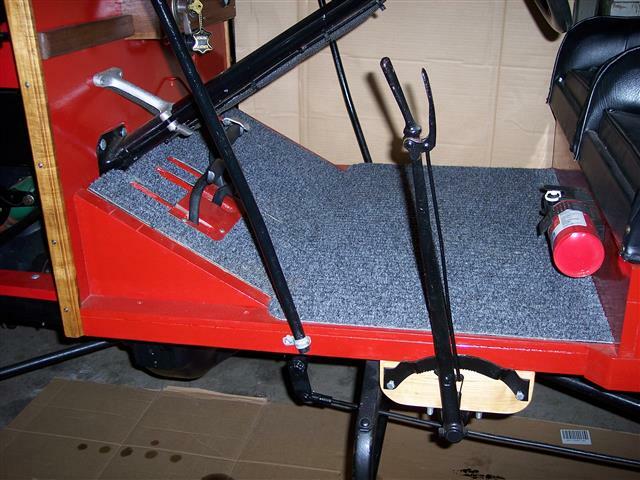 I think that would look neat and be out of the way of your feet/pedals when driving.